On tap at Poor Henry’s, serenely tropical hazy New England-styled pale ale (with IPA roots) offers brisk lemony grapefruit zesting, mild mandarin orange tartness and lactic yogurt souring to oats-sugared pale malts, retaining low resinous hop bittering. Subsidiary peach, mango, honeydew and pineapple illusions increase its irresistible fruited tropicalia. On tap at Poor Henry’s, briskly clean wheated pale ale spreads light citrus spicing across grassy hop astringency, dry pale malting and slight barnyard acridity. Polite Citra-hopped tingle pervades lemony clementine, navel orange and tangerine tang above wheat cracker base in highly sessionable manner. Floral orange-peeled grapefruit briskness gathers mild pineapple, peach, tangerine and mango tang above dry pale malt spicing as polite herbal hop bittering turns slightly astringent for straightforward moderate-medium-bodied West Coast pale ale less piney than its IPA counterparts. On tap at Ambulance, sweeping New England-styled hazy pale ale provides yellow grapefruit, candied orange, peach and mango serenity for herbal-tinged Mosaic-hopped medium body. Sour yogurt milking contrasts tangy fruitiness above groaty pale malts. On tap at Ambulance, juicy Citra-hopped medium body places lightly embittered grapefruit and tangy orange-pineapple-mango juicing above dry pale malting. Mild evergreen wisp drifts into sunny tropical fruiting. On tap at Shepherd & Knucklehead – Haledon, floral grapefruit-peeled orange tang and mild grassy hop astringency envelop Grateful Dead-inspired granola knockoff. Honeyed almond, oats and cereal grain influence unassuredly secondary to dry pale-malted citrus stead. On tap at Ambulance, sassy sessionable sureshot (with cool cartoon label) coalesces bright citrus zest with dank bark-dried wood tones, grassy herbal notions and tingly spicing over dry cracker-like pale malts. Lemony orange, clementine and tangerine tang picks up ancillary pineapple, peach, mango and tangelo illusions. On tap at Taphouse 15, easygoing beige yellow-hazed pale ale pairs perfumed yellow grapefruit tanginess with musky hop-oiled astringency, slowly gaining mandarin orange, tangerine and pineapple illusions above sweet grain malt bottom. Pleasant moderation blends mellow yellow grapefruit tanginess with subtle orange-tangerine linger, floral lemon dusting, grassy hop astringency and bready pale malts. Well-crafted mainstream fodder. On tap at Poor Henry’s, straightforward moderation retains lemony grapefruit tang, orange-dried tartness and grassy hop astringency above pilsner-malted wheat breading. A tad bolder than usual pale ale fare. 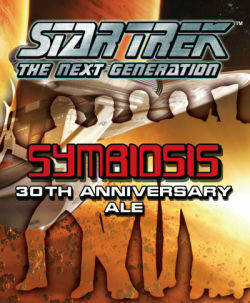 Basic easygoing pale ale designed for 30th Anniversary celebration in conjunction with Star Trek: Next Generation. Dry orange-spiced tang and honeyed lemon herbage struggle to the fore above biscuity caramel-Vienna malting, picking up a sour citric edge when warmed. Stylistically unresolved but quite quaffable.